I am sure you have heard me express my frustration at the sad state of politics in Hartford, before. Even before the terrible tragedy in Newtown, I have been advocating for real change in how we approach violence and murder in our cities, and safety and security in our public schools. Unfortunately, Gov. Malloy and his allies continue play political games with the safety of Connecticut's residents. They continue to offer more senseless gun control measures like banning bump-stocks and something the governor calls "ghost guns" - two items that have never been used in a single documented crime in our state. They also claim that anyone who disagrees "has blood on their hands." I'm sure you are as tired of this type of rhetoric and nonsense as I am. No one is in favor of crime or murder. So this past Tuesday, I challenged members of the Judiciary committee to actually do something real in an effort to get illegal guns off the street, and make our schools and cities safer. 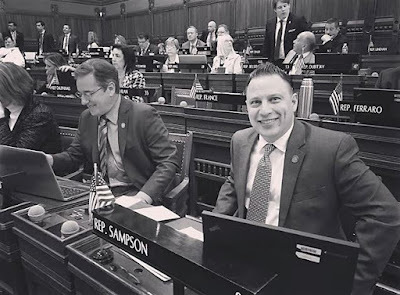 I offered legislation for an up or down vote that would have reversed the misguided $550 million Hartford bailout, and would instead use those dollars to fully fund the Statewide Firearms Trafficking Task Force, municipal grants for the hiring of school resource officers, and mental health beds for involuntary commitments under existing state law. Below is a link to my comments on this amendment. I hope you will watch this short, approximately 7 minute clip. The full unedited version of my comments on gun control and public safety can be found by clicking here. I gave legislative Democrats a real chance to take action on making our constituents safer instead of just offering rhetoric and accusations. Sadly, they proved for all to see what their priorities really are. These are things our constituents want to see us accomplish. I made it clear my door is open when my colleagues are done playing politics and are ready to concentrate on sensible policy. As always, please do not hesitate to contact me should you have any questions or concerns relating to state government at rob.sampson@housegop.ct.gov or at (800) 842-1423.